IDIOT- 1. an utterly foolish or senseless person. 2. a fool, half-wit; imbecile; dolt, dun: OBAMA SENDS $20 MILLION OF YOUR TAX DOLLARS TO KENYA TO KILL EVEN MORE BLACK BABIES: Lawmakers question whether Obama violated law..
OBAMA SENDS $20 MILLION OF YOUR TAX DOLLARS TO KENYA TO KILL EVEN MORE BLACK BABIES: Lawmakers question whether Obama violated law..
"Hey Barack, King Samir Shabazz said to kill 'white' babies, not black ones!" So wait a second, the NAACP and the New Black Panther Party are calling the tea parties 'racist,' but Obama contributes to aborting millions of black babies? Where's the NAACP and the New Black Panther Party on this one? What a bunch of sellouts and hypocrites. 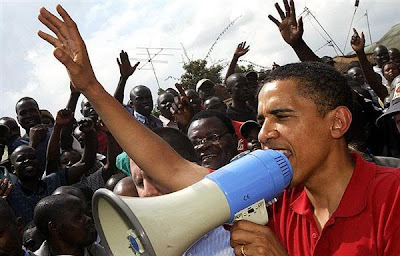 The Obama administration is offering incentives to Kenya to approve a controversial new constitution that would legalize abortion for the first time, promising that passage will “allow money to flow” into the nation’s coffers, including U.S. aid. A federal law known as the Siljander Amendment passed in 2006 makes it illegal for the U.S. government to lobby on abortion in other countries — and three U.S. lawmakers say they want a federal investigation into the promises made by the administration. Kenya has long been ripe for a new constitution, one that will balance power in the country and prevent the kind of violent rioting that followed Kenya’s 2007 presidential election. The Obama administration has vocally expressed enthusiasm for the new constitution, which it says will provide for easier transition of power through more balanced branches of government.